If you haven’t noticed by now, breakfast is my favorite meal. I think that I could eat pastries, French toast or pancakes for every meal of the day. I try to make my breakfasts somewhat healthy by eating some fruit alongside my carbohydrates and drinking a glass of skim milk. I’m a bit strange in another manner, I don’t like to eat eggs for breakfast. Yuk. If you find me eating sunny-side up eggs, it is most likely nine at night, not nine in the morning. For some reason eggs at night are a meal, whereas eggs in the morning are gross. Ooo, unless they are on a sandwich, with some bacon. So simple to make, this pastry is perfect for a lazy weekend morning. 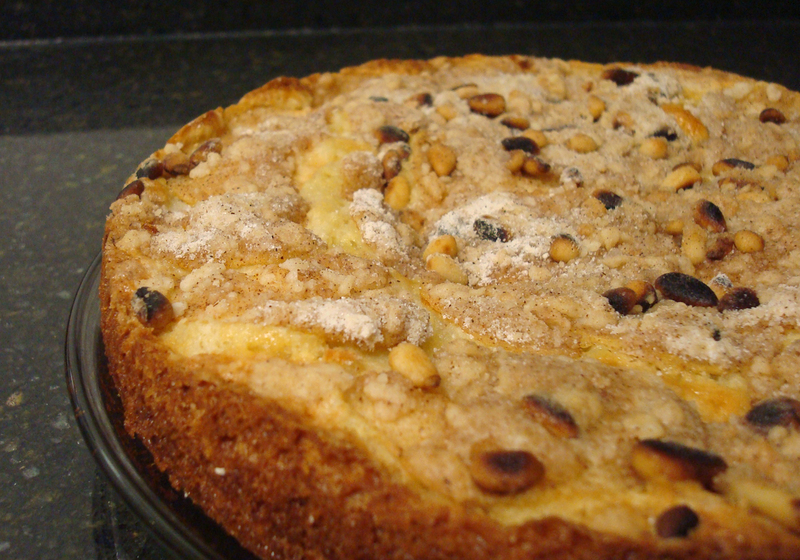 A simple coffee cake, fancied up with pears and pine nuts, this is just perfect. The leftovers (if there are any) can be kept in the fridge until tomorrow. Reheating is simple. Cut yourself a slice, heat in the microwave for 1 minute on half power. Once you learn to use the power settings in your microwave you will be amazed at what it can do. Play around, it’s fun! You can get non-rubbery pasta leftovers, perfectly thawed bread slices and even scrambled eggs. You might have noticed that my pine nuts got a little too toasted... Yeah, so I got distracted watching the end of Project Runway, and they burned. It only takes a few seconds to go from toasted to burnt, so watch out! I recently read a tip that you can microwave your nuts on high for one to two minutes to bring out those flavors. Give it a try and let me know! Mix flour, sugar and salt. Cut in butter using a pastry blender or two knives until butter is the size of peas. Remove 1/3 cup to another bowl and add pine nuts and cinnamon. To the remaining flour mixture add the remaining ingredients (except for the pears). Pour into a greased 9-inch pan. 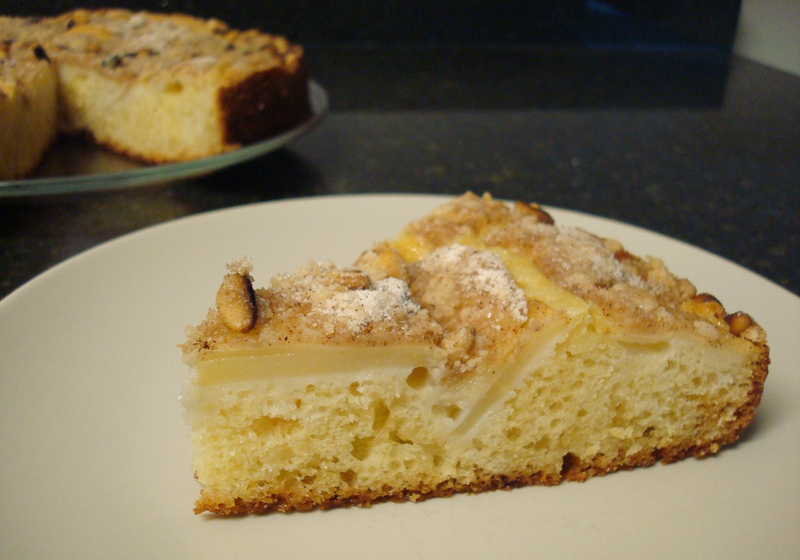 Lay slices of pear on top and sprinkle with the flour-pine nut mixture. Bake in a 350 F oven for 45 minutes (or until the cake tests done using a toothpick). Remove from oven to a wire rack and allow to cool for 15 minutes. Loosen edges from the pan and remove to a pretty plate. Serve slices warm for breakfast or a al mode for dessert! This looks wonderful, and I LOVE your suggestion for slicing pears. 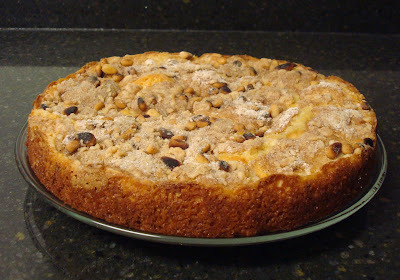 Pears are one of my very favorite fruits, and I'm always looking for new ways to use them. Thanks! Yum! I just bought some pears at the grocery.. I'm with you though, I could eat pastries every day of the week! I like the way you do math. I've been having eggs for breakfast lately because a nutritionist told me I need protein in the morning, but this looks like a much better option.